The requirements and criteria that a company must comply with originate from 6 perspectives or company aspects. Each company aspect is further subdivided into a number of company characteristics. A brief explanation of each company aspect and a summary of relevant characteristics are provided below. More iinformation on the assessment can be found in the certification scheme. How important is safety? Who or which body is responsible for (un)safe working? Do clear rules exist and are these complied with? Does the management stimulate and reward good behaviour? Does the management set a good example? What form does the communication on incidents take? Do managers and employees confront one another in a positive manner with undesired behaviour? Is safety high on the strategic agenda? What is the vision? Is safety fully integrated in the management cycle. Are regular awareness actions planned? To what degree is investment in safety behaviour regarded as a profit-enhancing factor? Are contractors selected on the basis of their safety behaviour and performance? Is attention given to safety in the contracting of subcontractors? How are new employee selected and instructed? 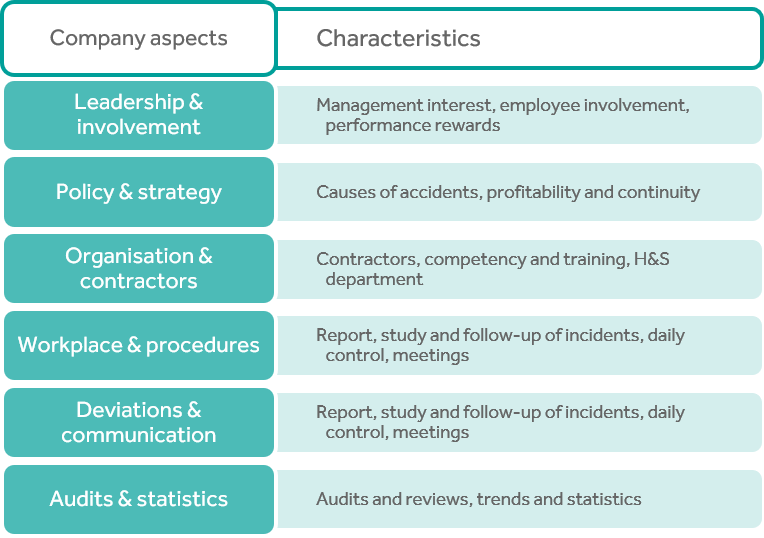 Is safety awareness included in the competence profiles. Are employees motivated to pursue further schooling/training? Do safety issues play a role here? Do safety officials have a high level of expertise and competency? Can a safety official directly approach the company director? How high is the risk awareness and what is done to optimise safety awareness at the workplace? Are rules and protocols applied? Are these tailored to the specific users? Are the improvement agreements resulting from a study always implemented? How is the reporting culture and what is done with the reports? Is the workplace regularly inspected? Are lessons learned from incidents? Are changes prompted by incidents implemented and evaluated in practice? Does sufficient communication and evaluation take place? Are specific audits held of safety behaviour? Does the company use statistics for improvement?